This week on Kathy Casey’s Liquid Kitchen®, I shake up a Rosemary Mandarin Sparkle! For this festive cocktail, fresh rosemary adds an herbal note while playing well with the vodka, mandarin, housemade honey syrup (3/4 cup honey to 1/2 cup hot water), and champagne bubbles. This cocktail can easily be pre-batched before your next holiday party, too! I just love this time of year. Everything is sparkly, the lights twinkling in the trees, and of course, candy canes! Those wonderful, seasonal peppermint treats that hang from trees, peak out of stockings and garnish your holiday latte. The holidays just wouldn’t be complete without them. They are also an ingredient in many of my favorite holiday goodies! 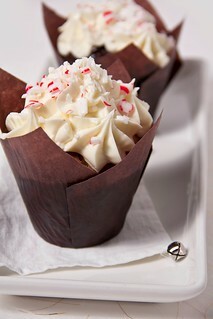 Peppermint and chocolate, what a great pair! Try my recipe for individual little Peppermint Chocolate Fudge Cakes – baked in muffin tins then drizzled with chocolate and sprinkled with crushed candy canes. They make a great little something to “take” or gift. Need a holiday cupcake idea? Whip crushed candy canes into your favorite frosting recipe and crown with a mini candy cane. D’lish and oh so festive! 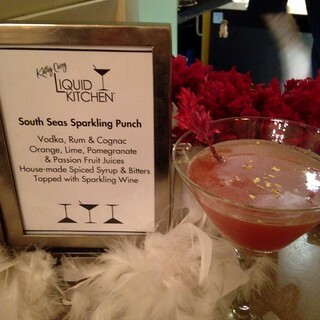 Photo by Kathy Casey Liquid Kitchen®. 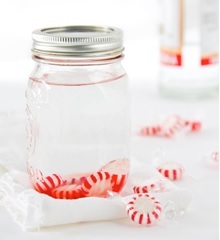 For a more spirited idea, try making candy cane-infused vodka! 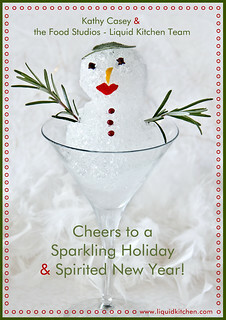 Just combine 1 1/2 cup of vodka plus 8 – 10 starlight peppermints or 6 mini candy canes in a jar with a tight fitting lid. Shake a couple of times a day until dissolved. Enjoy it in your cocoa or frozen as a shot. These are the perfect little something for after a big holiday dinner or for a party take-along. In a bowl over simmering water, melt the unsweetened chocolate and butter together. Meanwhile, with a whisk or electric mixer, in a large bowl mix the remaining cupcake ingredients together until glossy. Add the melted chocolate-butter mixture and beat again until glossy and smooth. Bake cakes for 15 to 16 minutes or until slightly puffy. Remove from the oven and let cool completely. Run a knife around the sides to release cakes. To decorate: Lay cakes out on a platter. Place each of the chocolate chips in small glass ramekins or very small microwave safe containers; add the vegetable oil to the white chocolate; and individually microwave for 10 second intervals (stirring in between) until just melted. Be careful not to overcook the chocolate. Immediately drizzle/decorate the tops of the cakes with the chocolates and then sprinkle with the crushed hard candies. 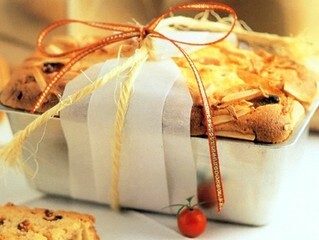 Cakes will keep covered at room temperature for up to 3 to 4 days. This week on Kathy Casey’s Liquid Kitchen®, I make a Chai One On cocktail! 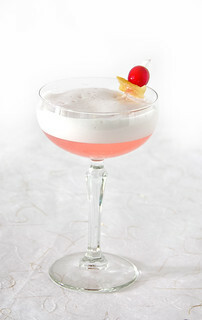 Using the classic Whiskey Sour as a template, this inspired drink mixes a chai tea-infused bourbon with PAMA Pomegranate liqueur, honey syrup, and fresh lemon juice to round out the flavors while the egg whites add texture. When the skies turn grey and the days are shorter, it’s easy to add a bit more sunshine to your winter with zesty Sunkist citrus. 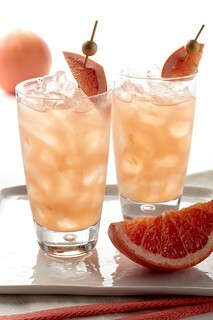 Tangy ruby grapefruits, zesty lemons, oranges from juicy navel and sweet cranberry-esque Cara Cara to deep pinkish-red Moro … these cheerful seasonal fruits add bright color and flavor to all things culinary, from batch-ahead cocktails to easy entertaining appetizers. My Tis the Season cocktail is perfect for those big holiday parties when you don’t want to be behind the bar the whole time. The pre-mix is a refreshing combo of fresh squeezed grapefruit and lemon juice, balanced with homemade simple syrup, white cranberry and vodka. Place it in a pretty bottle then just shake to order with a sprig of fresh rosemary and garnish with a beautiful cranberry for a seasonal sip that is sure to please. For an easy and elegant entertaining appetizer try my Citrus Bruschetta with Goat Cheese. Traditional tomato and basil bruschetta topping gets zesty with the addition of tart-sweet Cara Cara oranges, brilliant green Castelvetrano olives, and tangy goat cheese on crunchy crostini – d’lish! Looking for a savory nibble to pair with cocktails? Lemon Rosemary Pistachio Cocktail Cookies are the perfect size for teaming up with a holiday sip. Chock-full of lemon zest, fragrant rosemary, delicious feta cheese, and chopped pistachios, these bite-sized delights are finished with a light sprinkle of sea salt before they go in the oven. The dough can be made up to a week in advance and frozen until you’re ready to slice them up – perfect for unexpected visitors! Round out your menu with a sweet ending; Lemon Poppy Seed Panna Cotta with Blood Oranges is a breeze to prepare ahead, leaving you more time to enjoy your guests’ company – it can be made up to 5 days in advance! This light custard stars finely chopped lemon zest and poppy seeds sprinkled throughout, and gets a beautiful garnish of segmented blood oranges. Serve them up in mini martini glasses for a fun little something sweet or mini “apps style” dessert. Who wants to be tied to the bar during their party? Making a pre-mix for your signature holiday cocktail gives you more time to mingle with your guests and enjoy the festivities! Try shaking in fresh rosemary to add an herbal note. Measure the pre-mix into a cocktail shaker and fill with ice. Cap and shake vigorously. 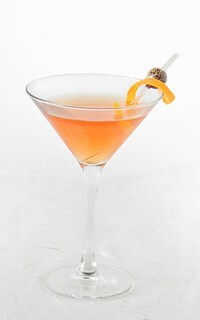 Strain into a large martini glass. 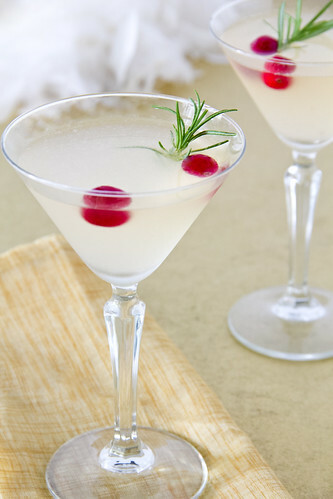 Garnish with rosemary and float cranberry in drink. Mixture can be made up to 4 days in advance and kept refrigerated. Combine sugar and water in a small sauce pan over medium-high heat. Bring to a quick simmer and remove from heat. (Do not reduce.) Cool to room temperature. Combine cooled sugar mixture and remaining ingredients in a pretty glass bottle. Refrigerate until ready to use. *Non-Alcoholic Version: instead of the vodka increase the cranberry juice to 1 1/2 cups and the grapefruit juice to 1 3/4 cups. Switch up traditional tomato bruschetta with the addition of sunny citrus and brilliant Castelvetrano Olives . 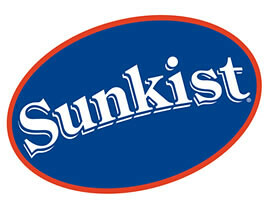 Sunkist Cara Cara Orange’s distinctive pinkish-red hue and sweet and tangy cranberry-like zing pair perfectly with the creamy goat cheese in this easy entertaining appetizer. Cut baguette into 1/4-inch slices — you want about 20 nice-sized pieces. Lay out on a baking sheet. Lightly brush or drizzle bread with olive oil then sprinkle lightly with kosher salt. Bake for about 5-7 minutes, or until toasty. Let crostini cool. To make the Bruschetta mix: Cut the top and bottom off of the oranges then with a small paring knife cut the peel and white pith off of the sides of the oranges. Cut each orange in half lengthwise and then dice 1/4 to 1/3-inch. In a medium bowl, toss the diced orange, olive oil, tomatoes, basil, onion, garlic, olives, and season with a pinch of pepper flakes and sea salt. Set aside. To assemble the crostini: Smear each piece of crostini with a heaping teaspoon of goat cheese. Place on a platter and immediately divide the orange mixture between the crostini (drain off any excess juice). Top crostini right before serving so they don’t get soft. *Available at most grocer’s olive bars. Studded with colorful pistachios and zesty lemon these savory bites are a great nibble with a cocktail. You can make the dough in advance and keep it in the freezer for impromptu guests. Spread the nuts (if not already toasted) on a rimmed baking sheet and roast until lightly toasted, about 5 minutes. Let cool, then coarsely chop. Set aside. In a mixing bowl, cream together the butter, cheese, sugar, lemon zest, rosemary and nuts with an electric mixer until light and fluffy. In a separate bowl, mix the flour and corn meal. Add the flour mixture to the creamed mixture and mix well, stopping and scraping down the sides of the bowl as necessary. Add the lemon juice and mix until incorporated. Preheat an oven to 325 degrees F at least 20 minutes before baking. Line baking sheets with parchment paper or spray them with cooking spray. Cut the dough into 1/4-inch-thick rounds and place about 1 inch apart on the baking sheets. Sprinkle lightly with salt. Bake for about 12 to 14 minutes, until cookies are lightly golden on the bottom and still pale on top. Let cool. * To make lemon zest: Zest is the outer peel of the fruit with no white pith attached. You can make fine zest with a zesting tool, microplainer or fine grater. This lush custard can be made up to 5 days in advance and kept covered in the refrigerator. Top with beautiful blood orange segments right before serving. For a fun mini dessert try serving in small martini glasses. To make the custards: Sprinkle the gelatin over the water in a small, microwave-safe bowl. Soak until the gelatin is soft. Place bowl in microwave on high power for about 3 seconds, or until the gelatin is melted but not foaming up. Meanwhile, in a large bowl, whisk the remaining ingredients together and place over a pan of simmering water. Whisk the mixture until it is smooth and warm. Add the liquefied gelatin, and whisk in to incorporate. Divide the mixture evenly into 6 small, glass custard dishes, pretty glasses, or 12 small mini martini glasses. Place the custards on rimmed baking sheets and cover with plastic wrap. Be sure the wrap does not touch the tops of the custards. Refrigerate overnight, or a minimum of 12 hours, before serving. To serve: Top each custard right before serving with blood orange segments. ** To segment oranges: Cut the peel and all the white pith from the oranges, exposing the flesh. With a small paring knife, cut out the orange segments over a bowl, saving any juice. The holidays are right around the corner and I have a few d’lish ideas for your favorite foodie – a local themed basket filled with handcrafted Pacific Northwest goodies! First off, a Sweet Basket: local chocolate bars (I love Fran’s Chocolate Gold Bars), neighborhood honey like 5130 Honey , salted caramel (Theo’s Chocolates’ caramel collection are wonderful), and unique preserves (we will have lots like Apricot & Rose Geranium and Clementine Ginger Marmalade at our Holiday Extravaganza), and cute little spoons to serve them up with. Next, a Savory Basket: local cheeses, cool pickles, herbed flat bread and crackers (Essential Baking Company has a great selection! ), and dried fruits, with fun cheese identification markers for your fromage. Stay festive during the holiday season with brand new episodes of Kathy Casey’s Liquid Kitchen®! Just in time for the holidays is my Atomic Orange Cocktail! PAMA Pomegranate Liqueur‘s tart flavors combines well with the fragrant DIY flash-blended Tangerine Ginger Water for this vodka cocktail. 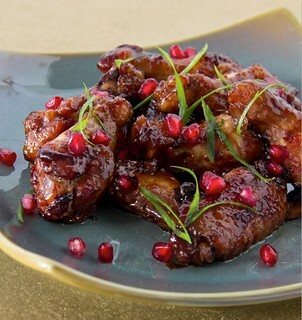 For your next holiday get together, freeze large cubes with pomegranate arils. My Holiday Extravaganza and “Over 21” Real Fruit Cakes! And come join us for a tasty Open House. We will be serving up lots of tasty sips and apps and I will be signing copies of my books Sips & Apps and my most recent D’Lish Deviled Eggs – yes, there will be lots of samples! We will be selling all kinds of tasty treats, including our ever popular “Over 21” Real Fruit Cakes made with Maker’s Mark (also available for purchase online), Dish D’Lish® specialty products, Kathy Casey Liquid Kitchen® bar goods, and all the tasty treats we have been putting up and baking like busy holiday elves! Stop by for a chat and load up on some holiday cheer! I hope to see you there! The New Liquid Kitchen Website is Live! I am very excited to announce that we just launched a brand new website for the beverage arm of my business Kathy Casey Liquid Kitchen®! Come check out and see we’re up to, meet my team members; watch an episode of my Cocktail Show and check out the recipe section for lots of great cocktail inspiration. Visit often for great cocktail and spirit news. 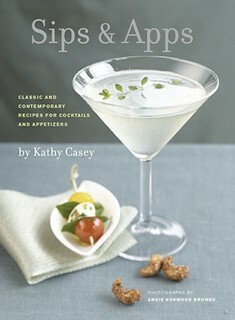 Sips & Apps – D’Lish eBook Deal!! It’s the holidays and Chronicle Books is celebrating with a special online deal! My Sips & Apps is one of their best nine holiday ebooks picked for their special “Tis the Season Sale.” For the entire month of December, ebook versions of Sips & Apps (available on Kindle, iBookstore, NOOK, Google play, and Kobo) are 75% off – $2.99! 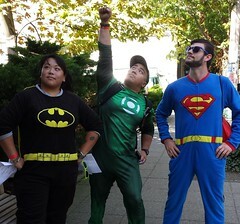 Heather, Erwin and Jason dressed up in their superhero onesies for the first ever scavenger hunt/race for Parkinson’s. That day was filled with lots of “call-ins” and computer searching! The KCFS crew all dressed up for the 1st annual Adventure Race for Parkinson’s! Wild mushroom hunting has to be one of my most favorite things to do. I became a member of the Puget Sound Micological Society over 20 years ago at the urging of dear friend and mycophagist Patrice Benson and have been hooked ever since. Patrice organized the cooking demo station at the annual show for years, and in her memory, I have been volunteering to cook up wild mushroom demos ever since. This year the society celebrated its 50th anniversary. I’m always asking foodie friends to join and so this year my longtime friend and salon owner/hairstylist glitterati Marco joined me; he is a great cook! We had a great day of sharing mushroom dishes with the crowd! This year’s weather was so perfect for mushrooms: rain, sun, rain sun… It was the most wild mushrooms that I have ever seen at the show – nature certainly cooperated this year! If you like foraging and fungi then check with your local wild mushrooms clubs to learn more and join in the fun! Spring morels will be here in no time! Marco & I and a bounty of Lion’s Mane mushrooms!! Meanwhile KCFS team members Heather and Jason headed down to New Orleans for the annual PMA Fresh Summit Conference with Sunkist! They shook up refreshing Grapefruit Honey Ginger Fizzes (fresh grapefruit juice and honey ginger syrup then topped with soda water) at the Sunkist Booth. Heather and Jason serving a fresh Grapefruit Honey Ginger Fizz! While they were in New Orleans, I was off to Portland Cocktail Week to be on the “How to be a Consultant” panel. This industry only event had bartenders coming from all over the US to participate in a week of classes and seminars… of course followed by lots of great parties. 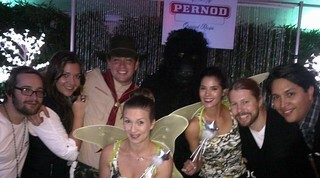 Karlyn Monroe and the Pernod Ricard team stop to pose for a fun photo at the industry party. My favorite drink of the night was a Pernod & Hot Chocolate with Homemade Marshmallows! After a little breather, I was off to emcee the annual auction for the Les Dames d’Escoffier – Seattle Chapter. This women-only international organization supports women in the food & beverage industry. The theme for this year’s auction was “There is Nothing Like a Dame” and featured my South Seas Sparkling Punch as the signature cocktail! The Seattle Chapter event raisee over $140,000 for culinary scholarships for women! 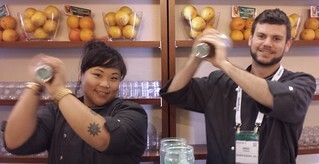 The Liquid Kitchen team synchronized shaking at the Dames Fundraiser! In November, I headed to New York for a special media tour and paring dinner with Martin Miller’s Gin. The dinner was at the famed 11 Madison Park restaurant. I created 5 cocktails and worked with Chef Brian Lockwood on the dinner pairings, bar manager Leo Robitschek executed the drinks with his bartenders. The food was amazing and our cocktail pairing collaboration was a hit! Food, cocktails, service … It’s not often I say FLAWLESS! The guest list was pretty spectacular – CNN, Martha Stewart Living, Food and Wine, Bon Appetit, Saveur, and the list goes on – very exciting! The whole theme on my Martin Miller’s holiday cocktails was: don’t get stuck behind the bar. Go enjoy your party and make party imbibing by pre-batching your cocktails hours (if not days before)! Check out some of the recipes in the Examiner, Chicagoist, and the UK’s Ideal Magazine! For those of you that remember my column Dishing with Kathy Casey in the Seattle Times – it was great to do a special feature all about easy holiday entertaining. 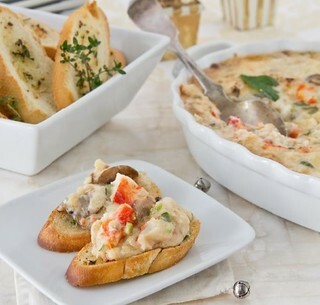 I include some do-ahead cocktails as well as delicious appetizers like Sticky Pomegranate Chicken Wings; Siracha Deviled Eggs with Crunchy Cucumber and Shrimp; and Warm Crab Dip with Mushroom and Brie served with Sea Salt and Thyme Crostini. All modern twists on favorites, with lots of do-ahead components so you’re not stuck in the kitchen at your holiday party! Need a Holiday Party Appetizer – I’ve got you covered! 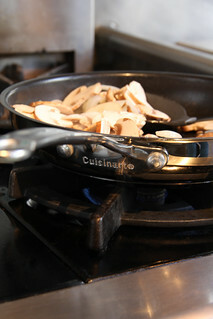 Mushrooms sautéing up for Warm Crab Dip in my favorite Cuisinart Pan! With the hustle and bustle of the holiday air travel, make sure to stay recharged and stop by Dish D’Lish at the Sea-Tac Airport. Whether you’re traveling by yourself or meeting someone, we have a café pre- and post-security. And for some holiday cheer we are featuring Peppermint Crush Cupcake, Frosty Peppermint Latte and Candy Cane Cocoa – all topped with Hammond’s handmade candy canes. For an in-flight treat or a little something to take home grab a signature candy cane or Candy Cane Crunch Chocolate bar. Yum! And be sure to check out all our other new menu items, including lots of gluten free options. Traveling and need to pick up a great gift? Sea-Tac Airport is full of fun places to shop; check out this special on New Day Northwest for ideas! I am grateful for such a wonderful year with amazing clients, wonderful co-workers and friends and family. Don’t forget to join me on my blog Dishing with Kathy Casey and weekends on KOMO News Radio for all things d’lish, including recipes, tips, and fun events. 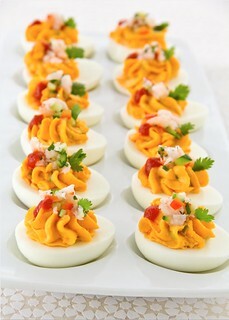 Read: D’Lish Deviled Eggs. Watch: www.LiquidKitchen.tv. If you haven’t signed up for my Newsletter, click here.